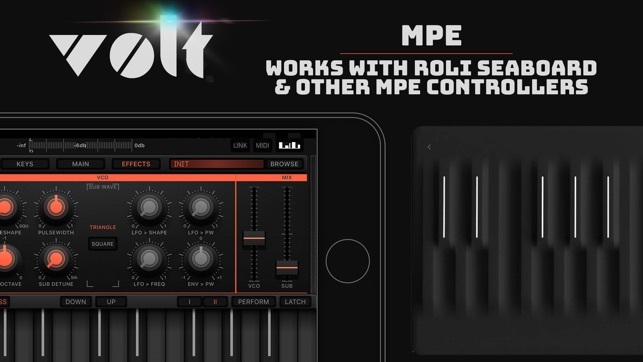 I’m a ROLI Seaboard player, always looking for instruments that will play nicely with MPE. I mostly use my MacBook for sound generation, but sometimes traveling light is the order of the day, and Volt has fast become a favorite on iOS. A lot of MPE-compatible apps sort of end at “compatible” — the function is there, but it’s not very musical in its application. 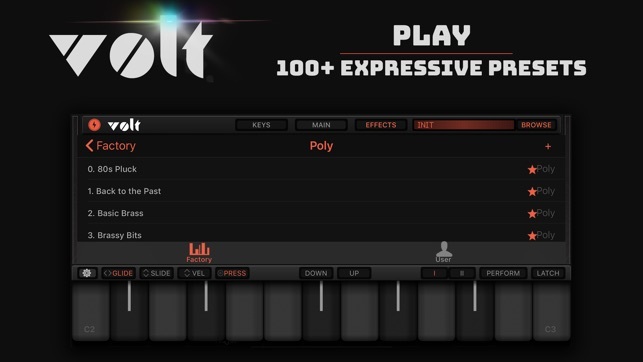 Volt makes is easier than even ROLI to map parameters to and apply modulation using 5D touch, and the sounds are much more geared toward the classic synth tones I’m always chasing. 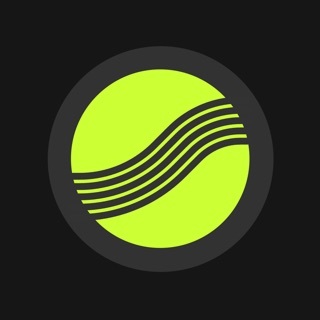 I will say that Roli’s MPE synth offerings are still more responsive to, and integrated with, the Seaboard, but their iOS offerings are inflexible, walled-garden, demo-level instruments. Moog’s Model D app still wins out as far as dead-ringer vintage sounds, but it’s not nearly as natural to play using MPE. 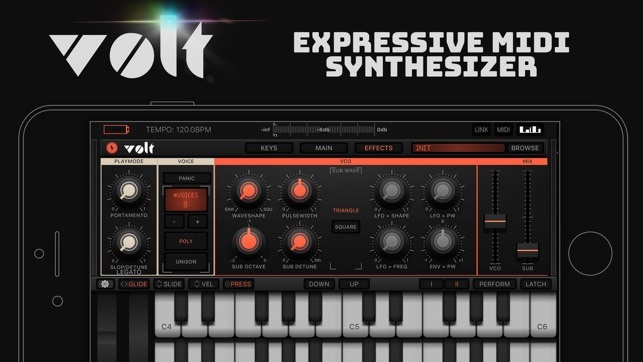 So all hail Volt, and kudos to any developer who puts in the hours to make something as expressive, versatile, and sleek as this synth. Any instrument this good at this price is a no-brainer. Enjoy it! 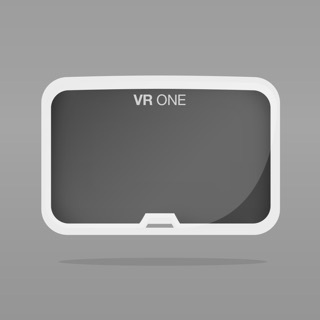 This is a really beautiful synth app in terms of both sound quality and its interface. However the latest version is creating some audio problems on my iPad (6th gen). With some of the presets, as soon as a touch a key, the VU meter goes full blast (into the red), and I hear zero audio. When I remove my fingers from the keys, the volume is still maxed out in the red almost as if it’s stuck in some sort of feedback loop... but still no audio at all. What’s more interesting is that if I switch to any other app while Volt is in this state, I can’t get audio from those apps either. 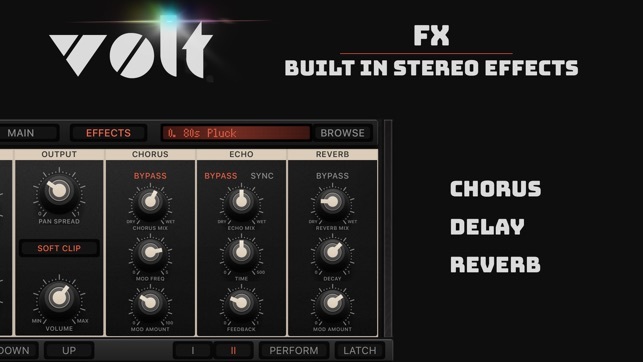 So it seems like Volt is causing some kind of system-wide audio problem. 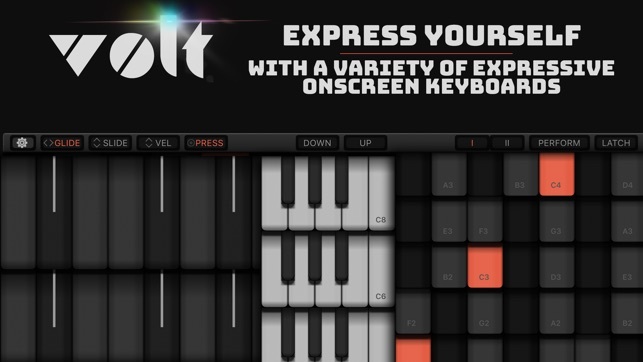 I’d love to be able to use Volt in a live performance situation because it sounds fantastic when it works. However, this problem makes that impossible. Increased my rating by 1 star to counter zodthemagnificent’s (lol) unfair rating. Thank you. And, naturally, I hit the ‘+’ for incrementing the playing preset and lost my settings again. Anyway, the far right ‘+’. :-) The fonts could be larger in the preset display screens and the orange selection highlight bar makes reading what’s highlighted hard. Tried saving my preset and Volt crashed, losing everything. 😡Not sure why three UI button views as FX is displayed with Main on my 12.9” iPad Pro. I can’t save any presets! Volt keeps crashing when I do. Having the digital readout for the controls under the control, your finger covers the value. Any latched key/s graphic disappears when you move the octave slider to another octave and back. You can’t tell what note/s are latched. Shelving Volt until the preset saving issue is fixed. I'm afraid that's a rather embarrassing bug as this non working/app crashing save button is a left over from an older version of the preset manager which should have been removed completely. So instead of using the "Save" button you would save a preset by tapping the "+" button located on the upper right. I realize that's not obvious at all and apologise for any frustration this may have caused. The good news however is that the issue is fixed in the upcoming update which has been submitted already and should be available shortly.